$aint $axo has been unleashed unto the masses. It's a full album of K*nny G chopped and screwed vaporwave madness, so feel free to grab it if you're into that sort of thing. 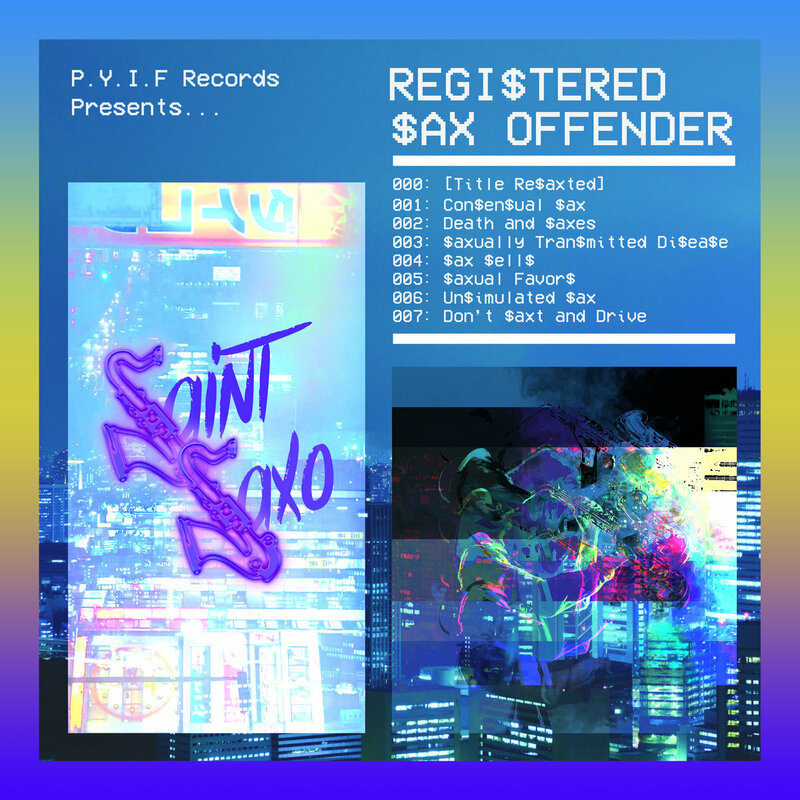 It's up for free download on the Pays-You-In-Fries Records bandcamp. So twisted! Glad you found just the right spot for that DJ air horn sound. Well played sir. I'll check it out just based on the sax puns. thanks a bunch NWSPR! yeah haha air horn was a last minute addition, thought it complemented K*nny's tomfoolery well. And sax puns are absolutely the bedrock upon which this endeavor is built. [quote=NWSPR]So twisted! Glad you found just the right spot for that DJ air horn sound. Well played sir. I'll check it out just based on the sax puns. [/quote] thanks a bunch NWSPR! yeah haha air horn was a last minute addition, thought it complemented K*nny's tomfoolery well. And sax puns are absolutely the bedrock upon which this endeavor is built. This is definitely on that "too much cough medicine" tip! +1 to NWSPR - that air horn is perfect! ﻿Ｓａｘｔａｓｔｉｃ! Love the album art as well, going to check out the album! Hey, you know what they say: it's $aint $axo, not $aint Violino. Thanks orangedrink! Was hoping the comedy of the ending would come across. I especially love abrupt endings like that when in an album tracklisting or in a playlist because it's just super jarring when the next song starts up & adds to the effect haha. Appreciate it Gab! Saxtastic indeeeeed. I guess this is how a bad trip feels like. Great stuff! that's a good way of putting it, trying to make the tracks sound diseased. Thanks for listening plantrain and scottux! Glad you could get into my strange sax side gig. The comedian is Mike Birbiglia haha, its from the special What i Should Have Said Was Nothing which I highly recommend. And thanks! gRaPhIc DeSiGn is my passion. [quote=kaedo sevaada][img]https://media.giphy.com/media/2FazbYdly6tSiDfP2/giphy.gif[/img][/quote] lest we all bask in his glory [quote=NinjaBaka]I guess this is how a bad trip feels like. Great stuff! [/quote] that's a good way of putting it, trying to make the tracks sound diseased. [quote=Plantrain]Wonderful weirdness! [/quote] [quote=scottux]this is great[/quote] Thanks for listening plantrain and scottux! Glad you could get into my strange sax side gig. [quote=underground Luau]lmao whos the comedian? love that album art[/quote] The comedian is Mike Birbiglia haha, its from the special What i Should Have Said Was Nothing which I highly recommend. And thanks! gRaPhIc DeSiGn is my passion. Haha almost feels like a especially trippy Tim and Eric skit or something. Otherworldly AND comedic.